Calling all foodie enthusiasts! Are you ready for the perfect weekend getaway for you and your family? 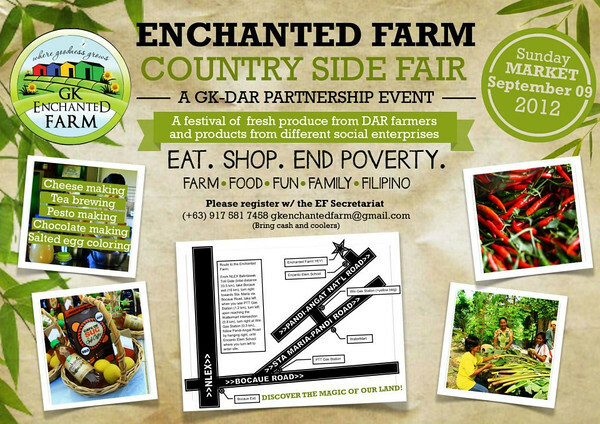 Gawad Kalinga, together with the Department of Agrarian Reform, bring you ENCHANTED FARM COUNTRY SIDE FAIR. A place where great food, fun & festivities await you! Register through the EF Secretariat at 0917.581.7458 or gkenchantedfarm@gmail.com. Head on out to the Enchanted Farm where you can discover the magic of our land. Eat, shop, have fun, help end poverty! See you there! For those who do not know, Gawad Kalinga is the movement that provides jobs and homes to so many people, whose products include Human Heart Nature products (organic and environment-friendly products made using local resources). This makes this fair very important because it will be VERY Filipino and surely inspiring.